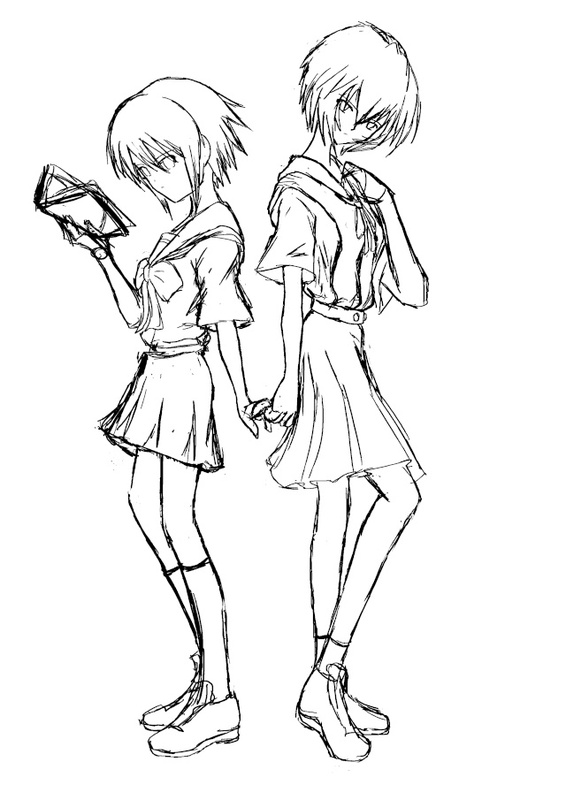 Just wondering if i should start a thread proper for the eva group or for anyone who can donate Evangelion artworks...was just sketching this today for fun. is that her younger self ? i think a crossover between the two will be quite interesting. one of the ways crossovers are done is by grouping characters of the same archetype. Was drawing my pic with this pic in mind, hoping to do something like this. I'm in the Evangelion group also. I was thinking about a big painting, but don't have time so I can only settle with simple one. Here is the first, I'll draw more when I have spare time. :\ the hair should be lighter blue i guess? like those really flashy neon blue. Another one, change style a bit. The inspiration comes from her red eyes, so thank Kageshiro for pointing that out. oh!!!! this one is really nice. simple but nice effects. i'm not sure if its me or do her hands look too.. small? Glad you like it. So I'll stick to the simple line art then. Her hand should be enlarged by about 2%, I think. I'll change it tonight. Another one for Asuka, I tried watercolor for the "dreamy" effect, but not so sure about the result. Anyone think it over-saturated? great work ^^ i'm not good with paints and water colours >_<;; am only just experimenting with digital and with colour so i haven't really got around to doing shading yet. I think her hair should be a bit more or the browner side. But its gd as it is. Her hair colour actually changes in many pics, ranging from dark brown to bright orange, depending on the desired effect. As her eva/plug suit colour scheme is red/orange, i suppose the lvl of colour is just right. Seeing the recent EVA movie has given me some inspiration for EVA merchandise ideas, or at least some amusing picture subjects. With the new movie, I guarentee EVA fever will be in full swing, might as well make use of this opportunity to churn out some EVa stuff. If anyone else has any ideas, feel free to share. "Shikinami-san~ , ningyo jya nai yo~~<3"